What made ME go to Myanmar in the first place? What made ME start loving the people, living here under difficult conditions? What makes ME wanting to go back again and again? Probably it was my childlike desire of discovering a secret, of doing something with an uncertain outcome, of touching something, that could be dangerous. And as in most cases, where you dare to do something unusual, the outcome is exciting, exhilarating, rewarding! 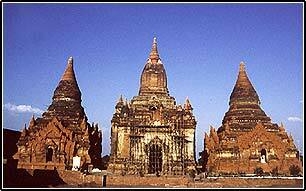 Myanmar is holding many secrets, waiting to be discovered by you! Or how Rudyard Kipling put it: "This is Burma, and it will be quite unlike any land you know." In which respect "quite unlike any land you know"? It's first of all the people, who make this country so unique: their quiet and subtle behaviour, their endless, open smile, they submit so graciously! You can't escape their charm, you will smile back and turn you into a happier mood! If you feel, you've had enough of cultural program, sit on the roadside, have a Banana Bladda (banana, covered by a crispy deep-fried dough) with a sweet glass of milky tea; take a ride on a Trishaw through Mandalay; enjoy a Puppet-show with an orchestra playing on traditional Burmese instruments! Have a chat with the locals or let you show how to eat Burmese style by using your right hand!